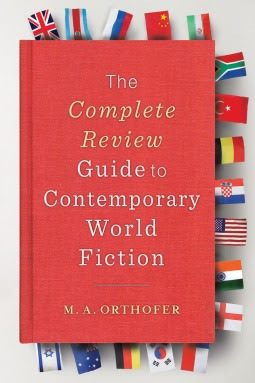 Orthofer lives in New York currently and was founder in 1999 of the complete review, a website dedicated to reviews of recent literature from around the world. In 2002 Orthofer included a blog, The Literary Saloon, which carries news from interviews, reviews, and notes on awards, publication, items of interest from around the internet. Orthofer has been updating it nearly every day. The reach of Orthofer’s interests is nothing short of astounding. In this compendium of contemporary world literature he tries to include short mention of the work of leading litterateurs around the world and includes dates of publication and translation when a work is mentioned. This is an indispensable guide for those interested in world literature for it introduces readers to new authors and commonalities among authors either in genre or style that allow us to find what suits our own voracious reading habits. This work can be read for itself, but it is more likely to be used as a reference text for readers interested in contemporary world literature. It can be downloaded as an ebook or referenced from the hardcopy. Continents are broken into constituent parts and each countries’ authors are mentioned with reference to their major works. While I have always thought myself interested in “world literature,” the range of this work makes me realize how parochial my reading has been, mostly limited to the overseas imaginings of writers of English. I note a recent entry in The Literary Saloon claims there has been a huge outpouring of translations of contemporary Arabic literature, a trend surely long awaited. ”Because American authors provide an enormous amount and variety of work, American readers are arguably spoiled for choice even without resorting to fiction from abroad…In almost every other country, foreign literature occupies a central and prominent position, but in the United States it seems to sit far more precariously on the fringes…foreign literature can offer entirely new dimension and perspectives…great literature knows no borders. Orthofer has attempted something most of us might consider impossible, and he has done a convincing job of it. If it lacks anything, it is up to us to help straighten it out. I highly recommend everyone have a look at this book to see what you are missing. If it seems overwhelming, I sympathize. Imagine how Orthofer felt when he began.